Put the chocolate in a heatproof bowl. Half fill a saucepan with water and bring to the boil. Remove from the heat and place the bowl over the pan, making sure it is not touching the water. Stir occasionally until the chocolate has melted. Leave to cool. Using electric beaters, beat the eggs and sugar in a bowl for 5 minutes, or until the mixture is thick, pale and increased in volume. Transfer to a large bowl. 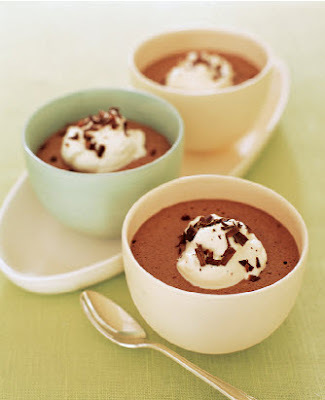 Using a metal spoon, fold in the melted chocolate with the rum, leave the mixture to cool, then gently fold in the lightly whipped cream until just combined. Spoon into four 250 ml (1 cup) ramekins or dessert glasses. Refrigerate for 2 hours, or until set. Serve with extra whipped cream and garnish with grated chocolate.